Ingredients: Organic Tapioca Syrup, Organic Rolled Oats, Organic Crisp Brown Rice, Organic Cashew Butter (Organic Cashews, Organic Sunflower Oil), Organic Brown Rice Protein, Organic Cashews, Organic Dried Tart Cherries, Organic Dried Cane Syrup, Organic Sunflower Seeds, Organic Agave Fiber (Inulin), Organic Chocolate Liquor, Organic Whole Grain Brown Rice Flour, Glycerin, Organic Expeller Pressed Canola Oil, Organic Flax Seeds, Organic Chia Seeds, Organic Cocoa Powder, Organic Rice Syrup, Natural Vanilla Flavor, Organic Oat Flour, Salt, Organic Molasses, Natural Sour Cherry Flavor, Organic Cocoa Butter, Rosemary Extract, Organic Vanilla Extract. Ingredients: Organic Tapioca Syrup, Organic Rolled Oats, Organic Crisp Brown Rice, Organic Almond Butter (Organic Almonds), Organic Almonds, Organic Brown Rice Protein, Organic Dried Cane Syrup, Organic Agave Fiber (Inulin), Organic Coconut, Organic Whole Grain Brown Rice Flour, Organic Chocolate Liquor, Organic Expeller Pressed Canola Oil, Glycerin, Organic Flax Seeds, Organic Chia Seeds, Natural Coconut Flavor, Organic Rice Syrup, Natural Vanilla Flavor, Organic Oat Flour, Salt, Organic Molasses, Organic Cocoa Butter, Rosemary Extract, Organic Vanilla Extract. Ingredients: Organic Tapioca Syrup, Organic Rolled Oats, Organic Cashew Butter (Organic Cashews, Organic Sunflower Oil), Organic Crisp Brown Rice, Organic Brown Rice Protein, Organic Cashews, Organic Sunflower Seeds, Organic Agave Fiber (Inulin), Organic Whole Grain Brown Rice Flour, Organic Dried Cane Syrup, Organic Blueberries, Organic Flax Seeds, Organic Chia Seeds, Glycerine, Organic Expeller Pressed Canola Oil, Apple Juice Concentrate, Organic Cranberries, Natural Strawberry Flavor, Organic Rice Syrup, Natural Blackberry Flavor, Organic Oat Flour, Salt, Organic Molasses, Citric Acid, Rosemary Extract. Ingredients: Organic Tapioca Syrup, Organic Rolled Oats, Organic Peanut Butter (Organic Peanuts), Organic Crisp Brown Rice, Organic Dried Cane Syrup, Organic Brown Rice Protein, Organic Whole Grain Brown Rice Flour, Organic Chocolate Liquor, Organic Sunflower Seeds, Organic Agave Fiber (Inulin), Glycerin, Organic Expeller Pressed Canola Oil, Organic Flax Seeds, Organic Chia Seeds, Natural Peanut Butter Flavor, Peanut Extract, Organic Rice Syrup, Organic Oat Flour, Salt, Organic Molasses, Organic Cocoa Butter, Natural Caramel Flavor, Rosemary Extract, Organic Vanilla Extract. Ingredients: Organic Tapioca Syrup, Organic Peanut Butter (Organic Peanuts), Organic Crisp Brown Rice, Organic Roasted Peanut Pieces, Organic Sunflower Seeds, Organic Brown Rice Protein, Organic Whole Grain Brown Rice Flour, Organic Agave Fiber (inulin), Organic Dried Cane Syrup, Organic Expeller Pressed Canola Oil, Organic Flax Seeds, Organic Chia Seeds, Glycerine, Natural Peanut Butter Flavor, Peanut Extract, Organic Rice Syrup, Organic Oat Flour, Salt, Organic Molasses, Natural Caramel Flavor, Rosemary Extract. Ingredients: Organic Tapioca Syrup, Organic Rolled Oats, Organic Cashew Butter (Organic Cashews, Organic Sunflower Oil), Organic Crisp Brown Rice, Organic Dried Cane Syrup, Organic Brown Rice Protein, Organic Cashews, Organic Sunflower Seeds, Organic Chocolate Liquor, Organic Agave Fiber (Inulin), Organic Whole Grain Brown Rice Flour, Organic Pumpkin Seeds, Glycerin, Organic Flax Seeds, Organic Chia Seeds, Organic Expeller Pressed Canola Oil, Organic Raisins, Natural White Chocolate Flavor, Natural Caramel Flavor, Organic Rice Syrup, Organic Acai Powder, Natural Strawberry Flavor, Organic Oat Flour, Salt, Organic Molasses, Organic Wheat Grass Powder, Organic Cocoa Butter, Organic Alfalfa Powder, Rosemary Extract, Organic Barley Grass Powder, Organic Vanilla Extract. 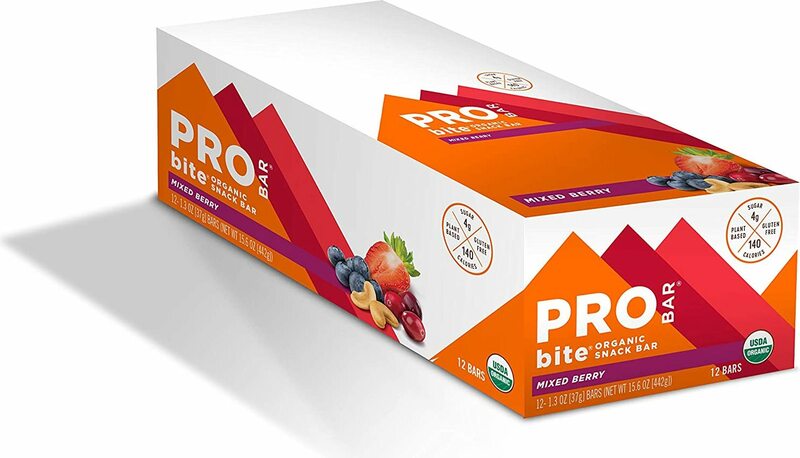 This PROBAR puts on-the-go and nutrition in the same bite. Quick, easy, scrumptious and packed with great tasting ingredients, this satisfying bite will energize your day. Nature’s bounty all in one bar: Superfruit + Greens combines acai, goji, and chia with an awesome grass mix that is sure to get your greens on.